To Cite: Darvish Damavandi R, Mousavi S N, Shidfar F, Mohammadi V, Rajab A , et al. Effects of Daily Consumption of Cashews on Oxidative Stress and Atherogenic Indices in Patients with Type 2 Diabetes: A Randomized, Controlled-Feeding Trial, Int J Endocrinol Metab. Online ahead of Print ; 17(1):e70744. doi: 10.5812/ijem.70744. Background: Cashews, as the main source of monounsaturated (MUFAs) and polyunsaturated (PUFAs) fatty acids, are associated with reduced risk of cardiovascular diseases. Despite evidence for beneficial effects of nuts on lipid profile and glycemic control, to the authors’ best knowledge, little is known about cashews. Methods: An eight-week, randomized, isocaloric, controlled-feeding study was conducted on 50 patients with type 2 diabetes mellitus (T2DM) randomly assigned to either the control or intervention group (10% of total calorie from cashews). Weight, fasting plasma glucose (FPG), serum insulin concentration and sensitivity, lipid profile ratio, high-sensitive C-reactive protein (hs-CRP), total antioxidant capacity (TAC), and paraoxonase-1 (PON-1) were measured at baseline and after eight weeks of intervention adjusted for age, gender, baseline values of FPG, insulin, HOMA-IR (homeostatic model assessment of insulin resistance), fiber, and both baseline and post-intervention vitamin C levels as covariates. Results: Weight, body mass index (BMI), and waist circumference (WC) were not significantly different in the groups after eight weeks of intervention, as well as between the two groups, compared with the baseline measures. At the end of the study, serum insulin and low-density lipoprotein-cholesterol-to-high-density lipoprotein-cholesterol (LDL-C/HDL-C) ratio significantly decreased in the cashews group compared with those of the controls (P = 0.01 and P = 0.04, respectively). Although, HOMA-IR decreased significantly in the cashews group (P = 0.03), changes were not significant compared with the baseline measures (P = 0.056). Despite more increase in PON-1 activity in the cashews group, the changes were not statistically significant. Conclusions: Daily consumption of cashews reduced serum insulin and LDL-C/HDL-C ratio in patients with T2DM. However, further studies with larger sample sizes and more duration are needed to confirm the current study results. Type 2 diabetes mellitus (T2DM) and its complications increase the risk of cardiovascular disease (CVD) (1). Diet can reduce the vascular complications of diabetes. Dietary components play important roles in the susceptibility to chronic diseases especially type 2 diabetes and CVD (2). Previous clinical trials and epidemiologic studies show that nuts such as pistachio, hazelnut, almond, macadamia, and especially walnut have beneficial effects on various mediators of chronic diseases including lipid concentration, inflammation, insulin resistance, and blood pressure (BP) (3-5). Studies on cashews are scarce and have inconclusive results (6, 7). There is an inverse association between nut consumption and diabetes, as well as CVD. But, weight gain due to high fat and energy dense content, especially cashews, is a concern (3). Then, it is important to assess the association between cashews and weight changes, as well as disease control to reach conclusive results to make commendations. The current study aimed at assessing the effects of cashews consumption by substituting for 10% of daily calorie intake with reduction in portion size of the fatty foods such as red meat and the amount of visible fats (oil, margarine, and butter) on body mass index (BMI), waist circumference (WC), atherogenic indices including total cholesterol (TC)/high-density lipoprotein-cholesterol (HDL-C), low-density lipoprotein-cholesterol-to-HDL-C (LDL-C/HDL-C), triglyceride (TG)/HDL-C ratio, high-sensitive C-reactive protein (hs-CRP), and homeostatic model assessment of insulin resistance (HOMA-IR), as well as total antioxidant capacity (TAC) and paraoxonase-1 (PON-1) in patients with T2DM. Fifty male and female patients with T2DM were selected from the individuals attending the Institute of Endocrinology and Metabolism, Iran University of Medical Sciences, Tehran, Iran. Inclusion criteria were age 30 - 75 years, BMI < 35 kg/m2, fasting plasma glucose (FPG) ≥ 126 mg/dL, two-hour plasma glucose (2h-PG) ≥ 200 mg/dL, glycosylated hemoglobin (HbA1C) 7% - 9%, serum LDL-C < 200 mg/dL, TG < 400 mg/dL, and BP ≤ 160/90 mmHg. The exclusion criteria were allergy to nuts, insulin therapy, smoking, history of stroke, heart diseases or thyroid dysfunction, nephropathy or retinopathy, medications that could affect body weight and/or energy expenditure, consumption of nuts more than twice per week, vegetarians, and weight-loss diets up to two months before the enrollment in the study. The study was approved by the Ethical Committee of Iran University of Medical Sciences, Tehran, Iran (code: 244/P26/M/T). All patients signed consent form before participation in the study. The current study was registered at ClinicalTrials.gov (No. IRCT138812252709N5). The current randomized, controlled-feeding trial was designed to assess the effects of cashews consumption on weight, FPG, serum insulin concentration and sensitivity, lipid profile ratio, hs-CRP, TAC, and PON-1 in patients with T2DM. Eligible participants were randomly assigned using randomization method. Fifty patients were randomly assigned to one of the control (n = 25) or the cashews (n = 25) groups receiving10% of total calorie from cashews per day for eight weeks. At first, 24-hour dietary recall forms were completed in three days (two regular days and one holiday) by a dietitian. These dietary intake data were analyzed by the N4 software (Nutritionist 4, First Databank Division, Hearts Corporation). All measures were recorded at the baseline and after eight weeks in the two groups. Blood samples were collected from the antecubital vein after fasting (10 - 12 hours), at the baseline, and eight weeks for biochemical analyses. After centrifugation for 15 minutes at 2500 g, the serum samples were frozen and stored at -80°C. All the participants were asked not to alter their medicine type and dosage during the test period. FPG and lipid profile were measured by an enzymatic method (Pars Azmoon Co. kit, Tehran, Iran). Insulin was measured by IRMA method (Immunotech Co. kit); homeostasis model assessment was employed for insulin resistance (HOMA-IR) (8) [fasting insulin (mU/L) × FPG (mM/L)]/405. TAC was determined using FRAP assay according to the method of Benzie and Strain (9). PON-1 activity was measured using the commercially available kit of Rel Assay Diagnostics (Gaziantep, Turkey) (10). The intervention group was asked to substitute 10% of their total calorie intake with cashews (~ 28 g/day, based on baseline calculated energy intake). It was achieved by reducing the portion size of the fatty foods such as red meat and the amount of visible fats (oil, margarine, and butter). This strategy allows cashews to be taken as snacks without increase in total calorie intake (11). Using this method, the subjects were asked not to make changes in their total daily energy intake. Also, the control group was asked not to change their dietary pattern. For each patient, according to the calculated daily energy intake, the required amount of unsalted cashews was determined and weighed by a digital scale (Beurer, model DS81). At the first visit of the patients, a predefined amount of cashews was given to each patient sufficient for a four-week period. At the end of the first month, an extra 100 g of cashews was delivered to each patient to increase the compliance of participants. All needed instructions were provided by a nutritionist for each subject, individually. The International Physical Activity Questionnaire (IPAQ) was used to measure physical activity level (PAL) and all patients were advised not to change PAL. Compliance was monitored once a week by telephone call and double checked by the three day food record questionnaire that was completed twice during the study period (at baseline and the end of the 8th week of the intervention). With considering a power of 80% and α = 0.05 (type I error), as well as mean difference of 17.4 mg/dL for TC and 8.51 mg/dL for LDL-C reported in similar studies (12), the number of needed subjects was 22 in each group. Given an anticipated dropout rate of 10%, the enrollment target was set to 25 subjects. All data were expressed by mean ± standard deviation (SD). The level of significance was set at P < 0.05. Statistical analysis was performed with SPSS version 15 (SPSS, Inc.). Normal distribution of the variables was checked by the Kolmogorov-Smirnov test. Independent t test was used to assess whether the differences between the mean values of the items studied in the groups were significant. The comparison of mean values of variables before and after the intervention in each group was examined by the paired samples t test. Analysis of covariance (ANCOVA) was performed for the changes of biochemical values by considering age, gender, baseline values of FPG, insulin, HOMA-IR, fiber, and both baseline and post-intervention vitamin C levels as covariates. Out of the 50 patients with T2DM, 43 subjects completed the study (nine males and 34 females; mean age 53.86 ± 7.22 years) (Figure 1). Gender distribution was as follows: Seven males and 15 females in the cashews group; two males and 19 females in the control group. No differences in gender and age distribution were observed between the two studied groups. Energy and nutrient intake were not significantly different at the baseline between the groups, except vitamin C and fiber intake (P = 0.006 and P = 0.02, respectively) (Table 1). PAL was not different between the groups at the baseline, as well as the end. At baseline, there were no statistically significant differences in anthropometric and biochemical measures between the groups (Table 2). Abbreviations: MUFA, monounsaturated fatty acid; PUFA, polyunsaturated fatty acid; SFA, saturated fatty acid. bP values for the differences between the groups at the end of the study. Independent t test was used. cP values for the differences within the groups from baseline to the end; the paired samples t test was used. Abbreviations: BMI, body mass index; FPG, fasting plasma glucose; HOMA-IR, homeostasis model assessment of insulin resistance; hs-CRP, high-sensitive C-reactive protein; PON-1, paraoxonase-1; TAC, total antioxidant capacity; TC, total cholesterol; TG, triglyceride; WC, waist circumference. aValues are expressed as mean ± SD. Significance was considered at P < 0.05.
bP values for the intergroup differences after eight weeks intervention. cP values for the intergroup differences from baseline to the end; paired samples t test was used. dSignificant difference between the groups after eight weeks intervention, evaluated by ANCOVA with baseline values as covariate including age, gender, FBS, insulin, HOMA-IR, dietary fiber, and vitamin C. vitamin C at the week 8 was also considered as covariate. Also, for TC/HDL-C, LDL/HDL, TG/HDL, PON-1, and hs-CRP, the baseline values of each variable were considered as covariates. Post-intervention analyses showed that except for monounsaturated fatty acid (MUFA) (P = 0.005), vitamins E (P < 0.001) and C (P = 0.018), other dietary components did not differ between the cashews and control groups (Table 1). Weight, BMI, and WC had no significant difference at the end of the study compared with the baseline measures (Table 2). HOMA-IR (P = 0.03), TC/HDL-C (P = 0.04), and LDL-C/HDL-C (P = 0.02) were significantly lower in the cashews than the control group at the end. No significant differences were observed in TG/HDL-C, hs-CRP, and TAC levels between the two studied groups (P = 0.52, P = 0.46, and P = 0.34, respectively). Despite the greater increase in PON-1 activity in the cashews group, the intergroup difference was not statistically significant. Moreover, no significant difference was observed between the two groups after eight weeks of intervention (P = 0.41). Using age, gender, baseline values of FPG, insulin, HOMA-IR, fiber, and both baseline and post-intervention vitamin C levels as covariates, serum insulin level was significantly lower in the cashews group compared with that of controls (P = 0.01), but HOMA-IR was not significantly different (P = 0.13). LDL-C/HDL-C ratio was significantly different, adjusted for baseline measures as covariates (P = 0.04). The current study results demonstrated that replacing 10% of daily total energy intake with unsalted cashews reduced serum insulin and LDL-C/HDL-C ratio (as an atherogenic index) in patients with T2DM. Few studies focused on the effects of different nuts consumption on diabetes and the published results are inconclusive. One study found that almond consumption (57 - 113 g/day) for four weeks had no effect on FPG and insulin status in patients with T2DM (13), while another one could not find any significant effect by incorporation of 30 g/day walnut into a healthy diet in patients with T2DM (14). This difference may be due to the time and amount of nuts in diets. Li et al. reported that a diet enriched with ~ 56 g/day almonds in patients with T2DM could effectively decrease FPG and insulin after four weeks. The HOMA-IR was significantly lower in the almond group (15). A high statistical power study with patients at high risk for CVD, half of patients with T2DM, revealed that following a Mediterranean diet including 30 g/day of mixed nuts intake (15 g walnut, 7.5 g almond, and 7.5 g hazelnut) could reduce FPG, insulin, and HOMA-IR during three months when compared with a low-fat diet (16). The decrease could be explained by the unique nutrient composition and bioactive compounds, as well as unsaturated fatty acids (MUFAs and PUFAs) present in cashews, which may play an important role in insulin and lipid profile control. Also, fiber and polyphenols may have anti-diabetic effects by regulating microbiome and lipid profile ratio (17-19). The current study found that cashews could improve LDL-C/HDL-C ratio in patients with T2DM. The current study results were in agreement with those of a randomized, crossover, isocaloric, controlled-feeding study, in which consumption of cashew nuts reduced TC, LDL-C, and non-HDL-C serum levels as well as TC/HDL-C ratio (7). Nuts, including cashews have unique nutrient contents, which can favorably affect lipid profile (3, 20, 21) in patients with T2DM (15). In the current study, TAC had no significant difference between the cashews and the control groups after eight weeks. The obtained results were in agreement with those of another study in which consumption of 30 g/day walnut for six months had no significant effects on TAC in patients with T2DM (14). Also, a study showed that incorporation of cashews or walnuts into the diet for eight weeks had no significant effect on plasma level of TAC in patients with metabolic syndrome (8). Based on the published studies, it seems that using TAC as a single marker of antioxidant status does not provide promising results. Some studies that used other markers of antioxidant status demonstrated that antioxidant effects of nuts were not limited to the improvement of TAC. Malondialdehyde (MDA) concentration as a marker of lipid peroxidation decreased in some studies using almond (22), walnut (23), or pecan (24). Nuts such as cashews are rich sources of antioxidants (25). Therefore, it seems reasonable to expect to be effective in antioxidant status. However, simultaneous use of several indices can provide more comprehensive results. In the current study, no beneficial effect of cashews consumption was detected on hs-CRP level. A 12-week feeding trial revealed that incorporation of raw-mixed nuts (15 g walnuts, 7.5 g almonds, and 7.5 g hazelnuts) into the diet could not influence the inflammatory biomarkers such as interleukine-6 or CRP levels in patients with metabolic syndrome (17). Substituting 20% of daily calorie intake with walnut or cashews at doses ranging from 63 to 108 g/day for eight weeks had no significant effect on CRP levels in such patients (6). However, a Mediterranean diet enriched with 30 g/day of mixed nuts could decrease other inflammatory markers in patients at high risk for CVD, while the CRP level did not change (16). There is evidence about the negative correlation between nut consumption and CRP level (4), but inflammatory biomarkers are usually considered as secondary outcomes in nut feeding trials. Therefore, the statistical power of studies was low to detect significant differences (26). PON is related to ApoA-I in HDL-C and prevents LDL-C oxidation in vitro and arterial wall. In the current study, PON-1 activity was not significantly different between the two groups after eight weeks. In contrast, walnut improved PON-1 activity in another study (23). Small sample size or different polyphenol components in different nuts may result in such differences. To the authors’ best knowledge, it was the first randomized, controlled-feeding trial conducted to assess the effects of cashews consumption on atherogenic indices, oxidative stress, and diabetes control. It was concluded that cashews consumption by substituting 10% of total calorie intake decreased serum insulin level and LDL-C/HDL-C ratio in patients with T2DM, although a larger sample size and longer duration are needed before reaching conclusive results. There were some limitations to the current study results; most importantly that it was better to design a crossover study. Authors wish to thank the patients that participated in the current study. Ethical Considerations: The study was approved by the Ethical Committee of Iran University of Medical Sciences, Tehran, Iran (code: 244/P26/M/T). All patients signed consent form before participation in the study. The current study was registered at ClinicalTrials.gov (No. IRCT138812252709N5). Financial Disclosure: Authors declared no financial disclosure related to the material in the manuscript. Funding/Support: The study was financially supported by Research Institute for Islamic and Complementary Medicine (RICM) (grant number: 15996). 1. Pitsavos C, Tampourlou M, Panagiotakos DB, Skoumas Y, Chrysohoou C, Nomikos T, et al. Association between low-grade systemic inflammation and type 2 diabetes mellitus among men and women from the ATTICA study. Rev Diabet Stud. 2007;4(2):98-104. doi: 10.1900/RDS.2007.4.98. [PubMed: 17823694]. [PubMed Central: PMC2036265]. 2. Luo C, Zhang Y, Ding Y, Shan Z, Chen S, Yu M, et al. Nut consumption and risk of type 2 diabetes, cardiovascular disease, and all-cause mortality: A systematic review and meta-analysis. Am J Clin Nutr. 2014;100(1):256-69. doi: 10.3945/ajcn.113.076109. [PubMed: 24847854]. 3. Sabate J, Oda K, Ros E. Nut consumption and blood lipid levels: A pooled analysis of 25 intervention trials. Arch Intern Med. 2010;170(9):821-7. doi: 10.1001/archinternmed.2010.79. [PubMed: 20458092]. 4. Jiang R, Jacobs DR Jr, Mayer-Davis E, Szklo M, Herrington D, Jenny NS, et al. Nut and seed consumption and inflammatory markers in the multi-ethnic study of atherosclerosis. Am J Epidemiol. 2006;163(3):222-31. doi: 10.1093/aje/kwj033. [PubMed: 16357111]. 5. Wien MA, Sabate JM, Ikle DN, Cole SE, Kandeel FR. Almonds vs complex carbohydrates in a weight reduction program. Int J Obes Relat Metab Disord. 2003;27(11):1365-72. doi: 10.1038/sj.ijo.0802411. [PubMed: 14574348]. 6. Mukuddem-Petersen J, Stonehouse Oosthuizen W, Jerling JC, Hanekom SM, White Z. 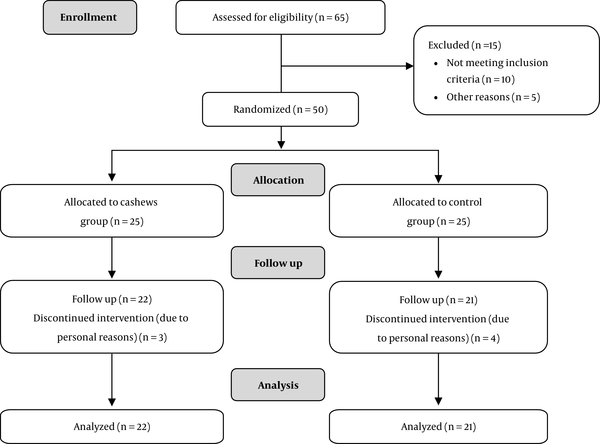 Effects of a high walnut and high cashew nut diet on selected markers of the metabolic syndrome: A controlled feeding trial. Br J Nutr. 2007;97(6):1144-53. doi: 10.1017/S0007114507682944. [PubMed: 17381974]. 7. Mah E, Schulz JA, Kaden VN, Lawless AL, Rotor J, Mantilla LB, et al. Cashew consumption reduces total and LDL cholesterol: A randomized, crossover, controlled-feeding trial. Am J Clin Nutr. 2017;105(5):1070-8. doi: 10.3945/ajcn.116.150037. [PubMed: 28356271]. 8. Davis L, Stonehouse W, Loots du T, Mukuddem-Petersen J, van der Westhuizen FH, Hanekom SM, et al. The effects of high walnut and cashew nut diets on the antioxidant status of subjects with metabolic syndrome. Eur J Nutr. 2007;46(3):155-64. doi: 10.1007/s00394-007-0647-x. [PubMed: 17377830]. 9. Benzie IF, Strain JJ. Ferric reducing/antioxidant power assay: Direct measure of total antioxidant activity of biological fluids and modified version for simultaneous measurement of total antioxidant power and ascorbic acid concentration. Methods Enzymol. 1999;299:15-27. [PubMed: 9916193]. 10. Yildiz A, Gur M, Yilmaz R, Demirbag R, Polat M, Selek S, et al. Association of paraoxonase activity and coronary blood flow. Atherosclerosis. 2008;197(1):257-63. doi: 10.1016/j.atherosclerosis.2007.04.004. [PubMed: 17537444]. 11. Kocyigit A, Koylu AA, Keles H. Effects of pistachio nuts consumption on plasma lipid profile and oxidative status in healthy volunteers. Nutr Metab Cardiovasc Dis. 2006;16(3):202-9. doi: 10.1016/j.numecd.2005.08.004. [PubMed: 16580587]. 12. Gebauer SK, West SG, Kay CD, Alaupovic P, Bagshaw D, Kris-Etherton PM. Effects of pistachios on cardiovascular disease risk factors and potential mechanisms of action: A dose-response study. Am J Clin Nutr. 2008;88(3):651-9. doi: 10.1093/ajcn/88.3.651. [PubMed: 18779280]. 13. Lovejoy JC, Most MM, Lefevre M, Greenway FL, Rood JC. Effect of diets enriched in almonds on insulin action and serum lipids in adults with normal glucose tolerance or type 2 diabetes. Am J Clin Nutr. 2002;76(5):1000-6. doi: 10.1093/ajcn/76.5.1000. [PubMed: 12399271]. 14. Tapsell LC, Gillen LJ, Patch CS, Batterham M, Owen A, Bare M, et al. Including walnuts in a low-fat/modified-fat diet improves HDL cholesterol-to-total cholesterol ratios in patients with type 2 diabetes. Diabetes Care. 2004;27(12):2777-83. [PubMed: 15562184]. 15. Li SC, Liu YH, Liu JF, Chang WH, Chen CM, Chen CY. Almond consumption improved glycemic control and lipid profiles in patients with type 2 diabetes mellitus. Metabolism. 2011;60(4):474-9. doi: 10.1016/j.metabol.2010.04.009. [PubMed: 20580779]. 16. Estruch R, Martinez-Gonzalez MA, Corella D, Salas-Salvado J, Ruiz-Gutierrez V, Covas MI, et al. Effects of a Mediterranean-style diet on cardiovascular risk factors: A randomized trial. Ann Intern Med. 2006;145(1):1-11. [PubMed: 16818923]. 17. Casas-Agustench P, Lopez-Uriarte P, Bullo M, Ros E, Cabre-Vila JJ, Salas-Salvado J. Effects of one serving of mixed nuts on serum lipids, insulin resistance and inflammatory markers in patients with the metabolic syndrome. Nutr Metab Cardiovasc Dis. 2011;21(2):126-35. doi: 10.1016/j.numecd.2009.08.005. [PubMed: 20031380]. 18. Kim Y, Keogh JB, Clifton PM. Benefits of nut consumption on insulin resistance and cardiovascular risk factors: Multiple potential mechanisms of actions. Nutrients. 2017;9(11). doi: 10.3390/nu9111271. [PubMed: 29165404]. [PubMed Central: PMC5707743]. 19. Imamura F, Micha R, Wu JH, de Oliveira Otto MC, Otite FO, Abioye AI, et al. Effects of saturated fat, polyunsaturated fat, monounsaturated fat, and carbohydrate on glucose-insulin homeostasis: A systematic review and meta-analysis of randomised controlled feeding trials. PLoS Med. 2016;13(7). e1002087. doi: 10.1371/journal.pmed.1002087. [PubMed: 27434027]. [PubMed Central: PMC4951141]. 20. Guasch-Ferre M, Li J, Hu FB, Salas-Salvado J, Tobias DK. Effects of walnut consumption on blood lipids and other cardiovascular risk factors: An updated meta-analysis and systematic review of controlled trials. Am J Clin Nutr. 2018;108(1):174-87. doi: 10.1093/ajcn/nqy091. [PubMed: 29931130]. 21. Askari G, Yazdekhasti N, Mohammadifard N, Sarrafzadegan N, Bahonar A, Badiei M, et al. The relationship between nut consumption and lipid profile among the Iranian adult population; Isfahan Healthy Heart Program. Eur J Clin Nutr. 2013;67(4):385-9. doi: 10.1038/ejcn.2013.21. [PubMed: 23422923]. 22. Jenkins DJ, Kendall CW, Marchie A, Josse AR, Nguyen TH, Faulkner DA, et al. Almonds reduce biomarkers of lipid peroxidation in older hyperlipidemic subjects. J Nutr. 2008;138(5):908-13. doi: 10.1093/jn/138.5.908. [PubMed: 18424600]. 23. Canales A, Benedi J, Nus M, Librelotto J, Sanchez-Montero JM, Sanchez-Muniz FJ. Effect of walnut-enriched restructured meat in the antioxidant status of overweight/obese senior subjects with at least one extra CHD-risk factor. J Am Coll Nutr. 2007;26(3):225-32. [PubMed: 17634167]. 24. Haddad E, Jambazian P, Karunia M, Tanzman J, Sabaté J. A pecan-enriched diet increases γ-tocopherol/cholesterol and decreases thiobarbituric acid reactive substances in plasma of adults. Nutr Res. 2006;26(8):397-402. doi: 10.1016/j.nutres.2006.06.022. 25. Bolling BW, Chen CY, McKay DL, Blumberg JB. Tree nut phytochemicals: Composition, antioxidant capacity, bioactivity, impact factors. A systematic review of almonds, Brazils, cashews, hazelnuts, macadamias, pecans, pine nuts, pistachios and walnuts. Nutr Res Rev. 2011;24(2):244-75. doi: 10.1017/S095442241100014X. [PubMed: 22153059]. 26. Ros E. Health benefits of nut consumption. Nutrients. 2010;2(7):652-82. doi: 10.3390/nu2070683. [PubMed: 22254047]. [PubMed Central: PMC3257681].